Dr. Don Blake’s story is, like Bruce Banner’s, one of living a double life. Sometimes you just have to keep your true identity a secret. Bruce Banner HAS to hide because he turns into a monster at night. If he didn’t keep his identity a secret, he would be hunted down during the day when he transforms back into your average Joe (this situation becomes a plot element in future Hulk stories once people start figuring out who he is). As for Donald Blake, I can understand why someone would go to great lengths to keep his power a secret. My only gripe is with the scenario depicted on the cover. If I were to find myself in a life or death situation, surely at first I might try and think of a way to escape WITHOUT making my secret known. However, in the worst case scenario where all hope is lost, a man has to do whatever it takes to live another day and continue to save the world. Right? So my problem with the predicament on the cover is that Donald Blake is shown saying, “It’s hopeless! Even Thor can’t save me know!” All he has to do is tap his cane on the ground! Thor’s second appearance isn’t against another swarm of alien invaders, instead, it has him facing a bunch of Cuban-esque Commies (but it takes place in the fictional South American country of San Diablo, not Cuba). I grew up in the mid-to-late 80’s, near the end of the Cold War. I don’t remember Communism being a prevalent focus on any of the comic books I had as a kid, and am still amazed by how much of a MAJOR role it played in these earlier comics. While I’m disconnected from the entire thing, it’s a fascinating look back at a time before I was born, and really paints a picture of Marvel being a great form of propaganda (though, I WAS familiar with Captain America’s glory days during WWII). Anyways, the Communist villains don’t really excite me much. I’ve always been fond of the Marvel rogue’s gallery that consists of scary, unique, or other-worldly looking villains. The story begins with news that there are two warring factions trying to control power in San Diablo. One side is democratic, and the other side is a pro-Communist faction led by a wannabe dictator calling himself “The Executioner”. 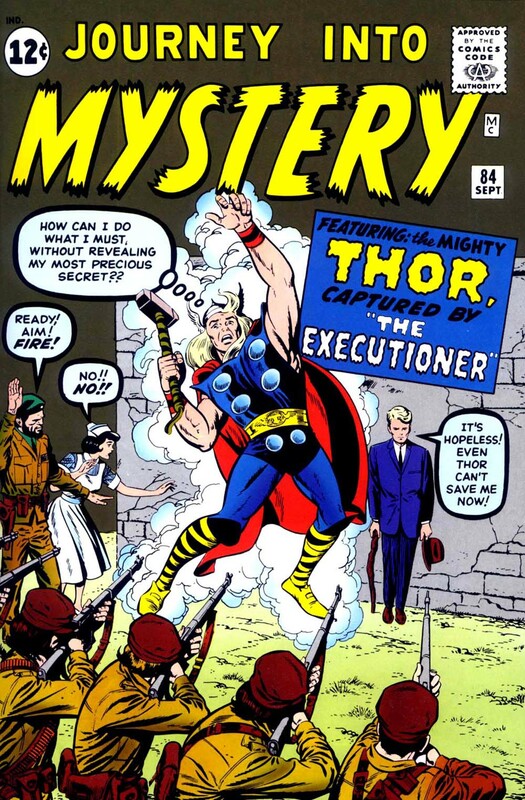 (Note: there will eventually be a different Marvel villain named The Executioner…which is also a Thor villain). People are in need of medical attention, and Donald Blake is one of a few doctors who volunteers to travel there. 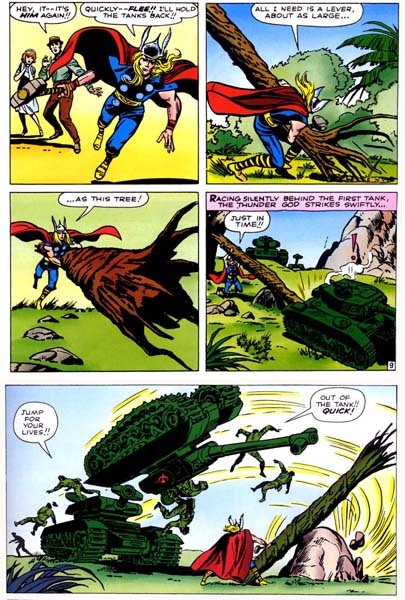 Thor fights off the first few batches of enemies he encounters by ripping apart several Soviet planes, while also creating a landslide with a thunder storm. He even rips a tree out of the ground, props it under an tank, and uses the tree as a lever to catapult the tank into the air. Pretty badass. When his crush, Jane, gets captured, he flees and turns himself back into an ordinary guy. Now powerless, he’s caught, and brought to the headquarters of The Executioner. In fact, he ends up in the VERY SAME situation depicted on the cover. Well…ALMOST. There is a slight difference…but it’s a big one. Remember my gripe about the cover? All he had to do was tap his stick? Well, the way things turn out, he doesn’t even have his stick when he’s made to stand at the execution wall. That is, he doesn’t have his stick UNTIL he taunts The Executioner for a one-on-one fight. The Executioner, who has the cane in his hands, approaches the wall, and Don taunts him by pretty much saying, “what, are you going to need that cane to beat me?” As The Executioner tosses it aside in an attempt to give in and not look weak by needing a weapon, Don steps forward to grab the cane. He INSTANTLY transforms into Thor without hesitation. Not once does he face the dilemma shown on the cover, and instead does exactly what I said that I would have done. Still…I would have bought this issue to see what he does, so the Marvel marketing genius worked. Now that he’s Thor, he needs to wipe out this army! In the distance we see the Democratic Army fast approaching, but with the enemies on the run, Thor has no time to wait. He uses his power to cause a volcano to erupt, and the flowing lava being enough to take out the Communists. …Wouldn’t that create MORE attritional devastation though? And now wouldn’t the Democratic Army ALSO have to flee the lava? Hrm…It might be a little too much, and hits the reader over the head harder than Mjolnir. I want to see some REAL villains next time – and by REAL, I mean less realistic. Does that make sense? NextCCA – The Comics Code Authority!